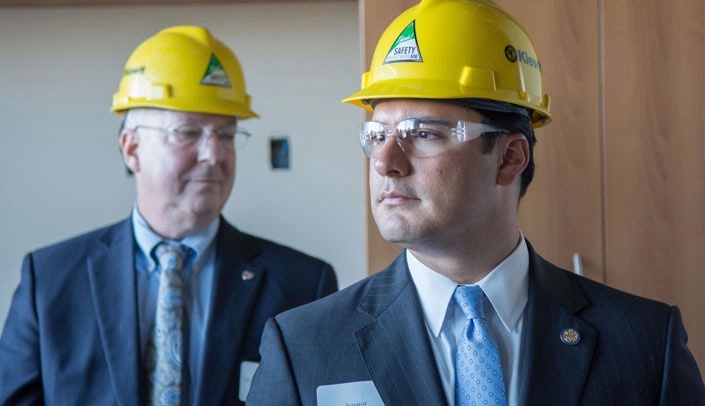 Nebraska State Sen. Heath Mello, at right with Fred & Pamela Buffett Cancer Center Director Ken Cowan, M.D., Ph.D.
Members of the Nebraska legislature toured the Fred & Pamela Buffett Cancer Center last week. They were hosted by UNMC Chancellor Jeffrey P. Gold, M.D., Nebraska Medicine CEO Daniel J. DeBehnke, M.D., and center director Ken Cowan, M.D., Ph.D. The state legislators were not the only guests to recently tour the facility. Members of the Douglas County Board of Commissioners visited UNMC on Aug. 22 to learn more about the Fred & Pamela Buffett Cancer Center and its potential impact on the state. To see a photo album from the state legislators' tour, click here. To see a photo album from the county commissioners' tour, click here. The UNMC Alumni Association is holding a kickoff weekend tailgating event on Sept. 10 from 9-11 a.m., prior to the Wyoming-Nebraska football game, at the Apothecary Building, North Loft, 140 N. 8th St., Lincoln. A $19 fee provides a breakfast buffet and two free drink tickets. Tickets to the football game are not included. To register for the event, click here or call 402-559-1063. The UNMC Department of Biochemistry and Molecular Biology's annual research symposium was held on Aug. 15. This year's theme for the symposium was cell-cell communication. Punita Dhawan, Ph.D., associate professor at UNMC, gave an overview of the role claudins play in cell communication. Keynote speaker Brant Isakson, Ph.D., of the University of Virginia, led a seminar titled "How discreet Pannexin 1 Cellular Interactions Translate to Novel Mechanisms (and Targets) of Blood Pressure Regulation." James Reinecke, Ph.D., Outstanding Achievement in Graduate Studies among Biochemistry and Molecular Biology Graduate Students. Two upcoming golf events offer a chance to have fun while contributing to a good cause. Kappa Psi's 2016 UNMC College of Pharmacy Golf Outing, benefiting the Ronald McDonald House, will be held Sept. 25 at Fox Run Golf Course in Council Bluffs. Tee-off is 1 p.m., with on-site registration beginning at 11 a.m. Registration is $55 for students and $75 for non-students. For more information and to register, click here. Phi Rho's Second Annual Golf Tournament Benefiting the Meyer Foundation for Disabilities will be Oct. 9. The 18-hold scramble includes a 1 p.m. shotgun start and 5:30 p.m. dinner at Benson Championship Golf Course, 5333 N. 72nd St., Omaha. Registration is $60 for UNMC students, $80 for non-students and $320 for teams of four. For more information and a registration form, click here Email here for any questions. The Nebraska Action Coalition Future of Nursing's 2016 40 Under 40 Emerging Nurse Leader Award will be presented to four faculty and a doctoral student from the UNMC College of Nursing. They will receive the awards Sept. 16 in Lincoln during a leadership conference. The award for emerging nurse leaders provides recognition of nurse leaders under age 40. UNMC recipients are: Melissa Snyder, West Nebraska Division; Sara Brown, Ed.D., Omaha Division; Kelly Gonzales, Ph.D., Omaha Division; Amy Ford, D.N.P., Omaha Division; and doctoral nursing student, Carli Zegers. They will be recognized for their unique contributions to leadership within the nursing profession through: clinical practice, education and teaching, administrative leadership, research, writing/publishing, policy involvement/self-governance, mentoring, and/or health care innovation.